The Moon has a surface area of some 37.96 million Km2, and a diameter of some 3,476 Km. 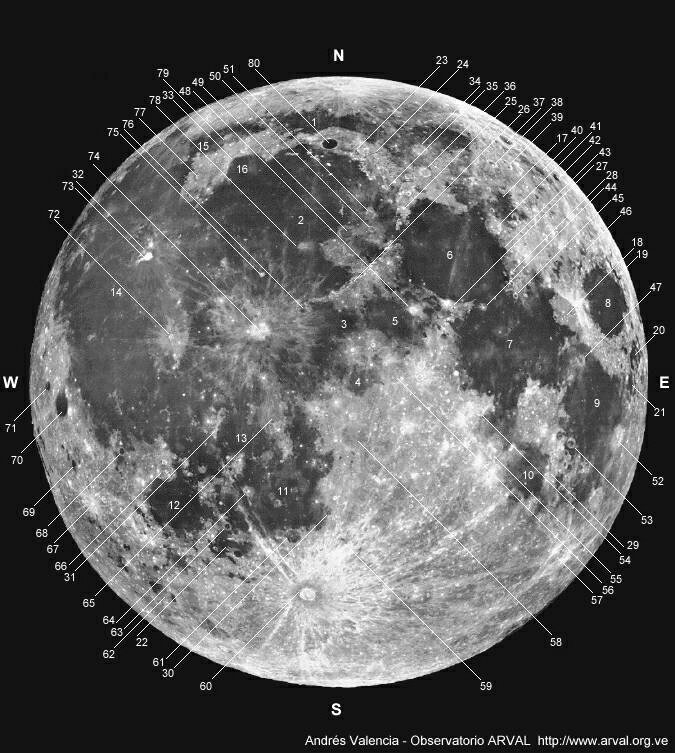 The directions East (E) and West (W) marked on the graphic, are directions as seen from the Moon; These are opposite of East and West as seen from the Earth. ARVAL's Moon Map shows the Moon as seen through binoculars or the naked eyes, it does not invert the image in any direction. The original Full Moon photograph, compressed and reduced for this page, is a copyright © of the UCO/Lick Observatory (University of California Observatories). Link to The Moon (in the "General Astronomy Information Leaflets" from the Royal Greenwich Observatory). For more information on the exploration of the Moon, link to NASA - Human Space Flight - Apollo History. Save the Palm FireViewer image MoonMap.pdb (145 KB, 16 Gray - High Compression) in your hard drive. Install the program FireViewer. Then install MoonMap.pdb in your Palm Handheld. or the channel Observatorio ARVAL - Moon Map (GR), with the text from this page and a reduced map, for Palm OS 5 (13 KB). Now you have a good map of the Moon in your Palm! Best seen in font Verdana with MS Internet Explorer. See About the Web Pages of Observatorio ARVAL.